(Nanowerk Spotlight) Wearable electronic textiles are not too far off (see for instance: Nanotechnology e-textiles for biomonitoring and wearable electronics) and these textile-embedded electronics will have an equally flexible and embedded energy supply (read more: Graphene yarns facilitate energy storage textiles). Ideally, these textiles will even charge themselves with integrated solar cells. The most common flexible substrates used for flexible solar cells so far have been synthetic polymers such as polyethylene terephthalate (commonly known as PET) and polyethylene naphthalate (PEN). However, if organic solar cells are to be applied onto clothes and other soft surfaces – some of which come into direct contact with skin – they are required to be human-compatible, non-toxic and non-irritable. One possible solution for such a substrate could be silk. 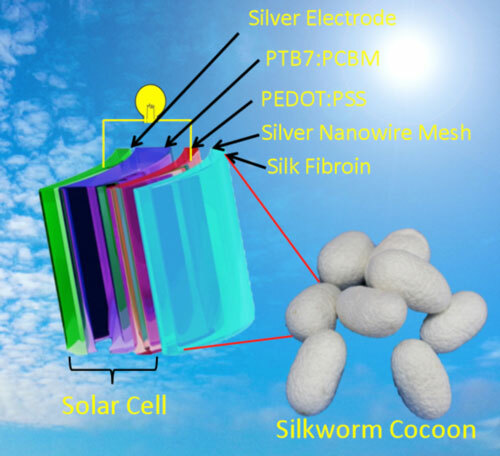 "The natural silk fibroin – extracted from the silkworm (Bombyx mori) cocoon – is a promising alternative material due to its good biocompatibility, biodegradability, non-toxicity, non-irritability and advantageous mechanical properties, as well as high optical transmittance (90-95%) of films," Baoquan Sun, a professor in Materials Science at Soochow University in Suzhou, PR China, tells Nanowerk. "Furthermore, the biodegradable and mechanical properties of silk fibroin substrates can be tailored by controlling the fabrication process, such that they match the desired requirements for some specific application." Sun and his team, together with researchers from the National Engineering Laboratory for Modern Silk, also at Soochow University, integrated a biocompatible silk fibroin with a mesh of silver nanowires to achieve a flexible, transparent, and biodegradable substrate for efficient plastic solar cells. They have reported their findings in ACS Applied Materials & Interfaces ("Highly Flexible and Lightweight Organic Solar Cells on Biocompatible Silk Fibroin"). "Our flexible substrate can achieve a conductivity of ∼11.0 Ω/sq and a transmittance of ∼80% in the visible light range, which is much better than the commercialized flexible substrate such as indium tin oxide coated PET and indium tin oxide coated polyethylene naphthalate," says Sun. "The power conversion efficiency of 6.6% is relatively high on the silk fibroin substrate." He points out that, even after extremely rigid bending, the devices retain a stable conductivity that is superior to traditional flexible ITO-PEN substrates. He also notes that the conductivity of bent silver nanowire silk fibroin substrates can be recovered via a 'self-healing' process. In order to form a continuous conductive film on transparent films, silver nanowire mesh is usually fabricated by directly spin- or spray-coating onto a transparent substrate. The resulting film is rough due to the random distribution of silver nanowire piling on the substrate. "This roughness is a disadvantage because substrate flatness is critical to fabricating the ∼100-nm-thick active layer of the plastic solar cell," explains Sun. "Additionally, the deposited silver nanowire displayed poor adhesion properties on the substrate." To resolve this problem, the researchers first deposited silver nanowires on a flat model substrate instead of being directly deposited onto the substrate. Then, the aqueous silk fibroin solution was coated onto the silver nanowire-covered substrate. This work illustrates another step towards fully biocompatible plastic solar cells that one day might be integrated with objects and devices of everyday use and even with living tissue for some futuristic bionic applications.